The French Provincial Buffet has five drawers and two doors. The drawers are on metal glides for ease of use and strength. 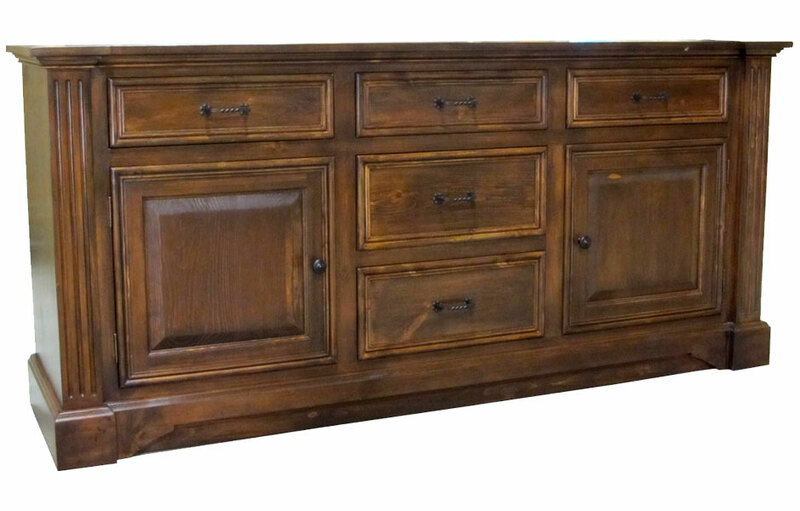 This sideboard has a staggered front on each end of the cabinet with a fluted molding and cap. The drawers have a raised mitered molding and the doors have a bevel panel design. Behind each door is a shelf centered in the opening and it is adjustable. 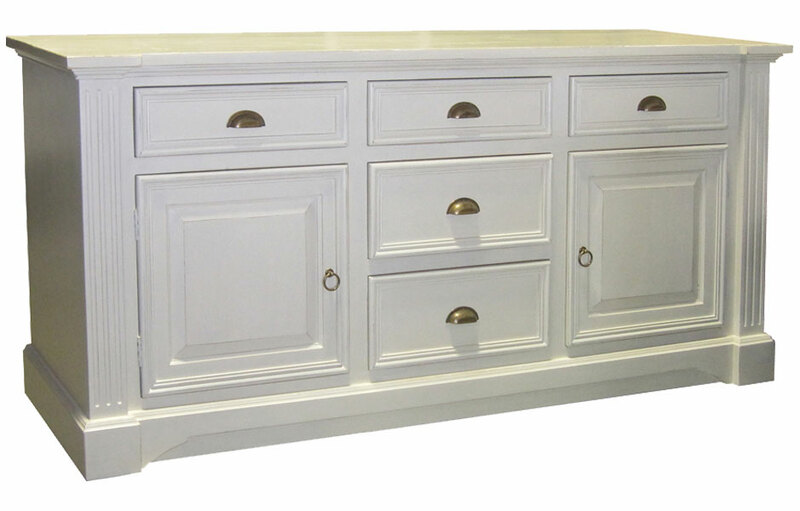 Add refined European style to your dining room with the French Provincial Buffet. 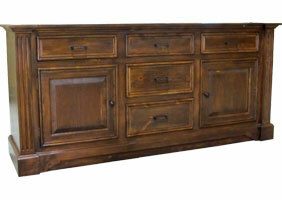 The solid wood sideboard will house all your china, glass, linens and flatware with sophistication. 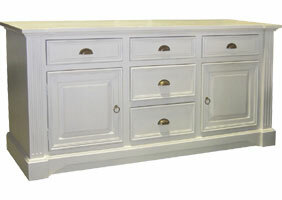 The French Provincial Buffet has a bounty of storage with five drawers and two doors. The five deep drawers glide effortlessly on metal glides for ease of use and strength. The two side cabinet doors open to one adjustable center shelf to store small and large items. 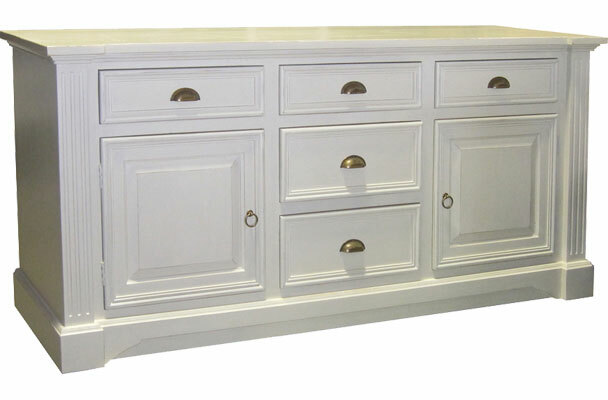 The French sideboard has a grand fluted ends with offset front columns on each end of the cabinet. The drawers have panels with mitered molding, and the doors have a bevel panel design. The European hand-forged iron ring pulls add to the elegance of the buffet. The 78" long sideboard can be painted in a classic two-tone finish with a stained interior and top, with painted exterior, or all-over one color finish. The top is water-sealed for daily-use, and food and drink service. The versatile sideboard can be used as a media console for large flat screen TVs, home office console or low wide storage cabinet in any room. The French Provencial Buffet complements French Country, English Cottage, Farmhouse, Rustic, Transitional and Traditional style decors. French Provincial Buffet with Sturbridge paint. French Provincial Buffet finished with Walnut stain.